As if the SXSW lineup needed to get any bigger, Jay Z and Kanye West have been added to the already star-studded festival. Samsung announced Monday that the two hip hop giants will kick off the brand's four-day concert series in Austin on Wednesday, March 12. Samsung Galaxy owners are in luck, as they're eligible for wristbands — one for the owner, and one for a guest — that will grant entry into the concert (the location has not yet been announced). Complimentary tickets for Galaxy owners will be distributed Tuesday morning at 10 am at the Galaxy Experience located on 2nd Street and Trinity — and we expect them to go fast. 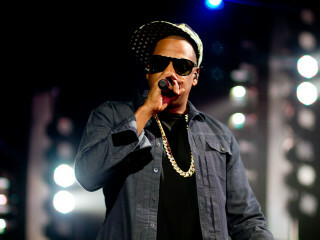 Jay Z last descended upon SXSW in 2012, as part of a concert series presented by American Express. Wednesday night's show will be the first time that Jay Z and Kanye West have performed together since 2012's Watch The Throne tour, Samsung said in a press release. Other performances announced for the Samsung concert series, which runs through Saturday, include Janelle Monae, Gary Clark Jr., Broken Bells, Cut Copy and Holy Ghost.